The same hills, valleys, sand dunes as “The Rabbit Run”, but this time more sand, and yes – the same river crossing to get your feet wet before crossing the finish line. 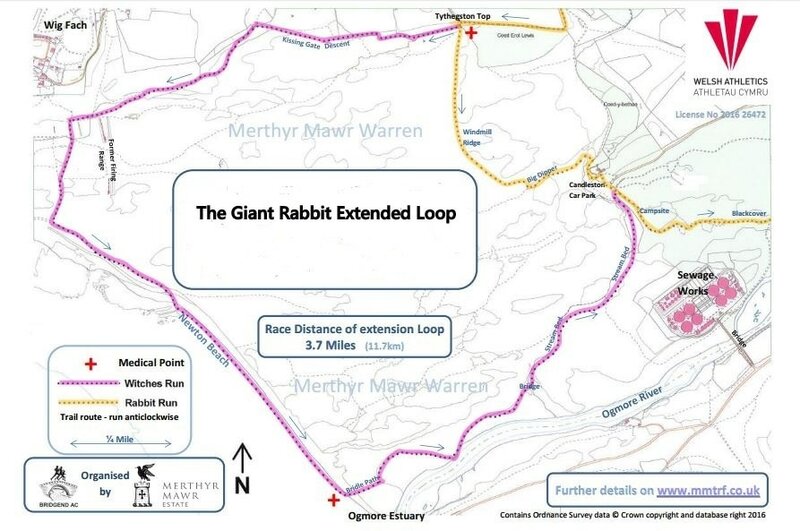 “The Giant Rabbit” is for the braver runner who wants to experience the iconic aspects of both the Merthyr Mawr Estate and the surrounding area. Your run is nearly 18 miles of some of the most beautiful coastal scenery you could ever want to run through. Once you’ve finished the Rabbit Run the first time around, you’ll be sent out again, and we’ve added an 3 extra miles of strength sapping sand dunes and the beach to make this a true test of your trail running strength. You’ll experience everything that The Rabbit Run can throw at you, but in addition you’ll see the ocean close up and feel the sea spray on your face, before heading back inland to the river crossing and home to the finish in front of Merthyr Mawr House. What: 18 miles, comprising the full loop of The Rabbit Run, then heading back out, adding additional 3 miles south along the shoreline, before returning along the course of the The Rabbit Run.